The YoYoFactory crew was in and out of PNWR, fresh off the heels of the International Toy Fair in NYC, but Ben still managed to find time to shoot enough for a sweet trick showcase video. Awesome! Shu Takada x Kuma Films – YoYo Ninja! The always amazing folks at Kuma Films have created another instant classic, this time with World YoYo Champion Shu Takada! Filmed in Japan, Kuma Films once again showcases our weird little sport with impeccable quality video beautiful cinematography. The always amazing folks at Kuma Films have created another instant classic, this time with World YoYo Champion Shu Takada! Filmed in Japan, Kuma Films showcases one of the best members of our weird little sport with impeccable quality video and beautiful cinematography. 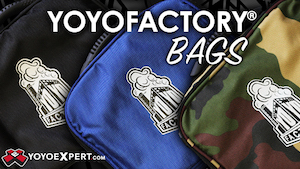 Be sure to subscribe to them on YouTube, and check out the rest of their channel for a TON of great skill toy videos. CJ Atkinson and Tyler Severance drop some gold in this new video for the latest release from Recess Intl. The Little League is a new undersized organic-shaped yoyo from Recess, built for both play and nostalgia. That comfy, organic feel brings back memories of the earlier days of modern yoyoing, while the performance is plenty good enough to keep up with players like Tyler and CJ. Good stuff. The Little League is available now at Recess' website, and hits stores soon. CJ Atkinson and Tyler Severance drop some gold in this new video for the latest release from Recess Intl. The Little League is a new undersized organic-shaped yoyo from Recess, built for both play and nostalgia. That comfy, organic feel brings back memories of the earlier days of modern yoyoing, while the performance is plenty good enough to keep up with players like Tyler and CJ. Good stuff. The Little League is available now at Recess’ website, and hits stores soon. Yoyo used is the Recess Little League. World YoYo Champion Evan Nagao shows off his latest signature model, the Monster Edge! This ultra-wide model calls back to the first YoYoFactory that Evan used to start making a name for himself on the contest scene, but with stylings of his new Edge signature series. Awesome! 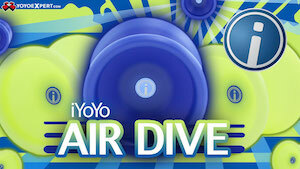 YoYo used is the YoYoFactory Monster Edge. World YoYo Champion Evan Nagao shows off his latest signature model, the Monster Edge! This ultra-wide model calls back to the first YoYoFactory that Evan used to start making a name for himself on the contest scene, but with stylings of his new Edge signature series. Awesome! 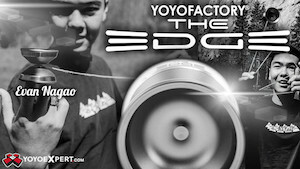 YoYo used is the YoYoFactory Monster Edge.